remote areas where water resource is available but hydrant network is not available. 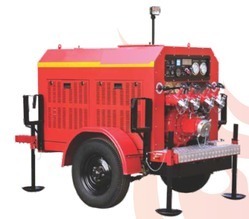 "Rohit" make trailer fire pumps are available with Normal Pressure pumps as well as multipressure pumps. These Fire Fighting units are equipped with diesel engines of compatible capacities. These trailer fire pumps is used for fighting fires and can also be used for de-watering purposes. Available with choice of primers - Manual and Automatic. Pumps Available in Gunmetal and Aluminum constructions. Compact and low maintenance design. Suction and Deliveries as per pump capacity. Engine Options include- Cummins, Tata, Ashok Leyland, Kirlosker, Mahindra, Etc. Meets the requireents as per BIS Standards. Looking for Trailer Fire Pump ?